A delightfully tasty treat to surprise someone special in a special way. 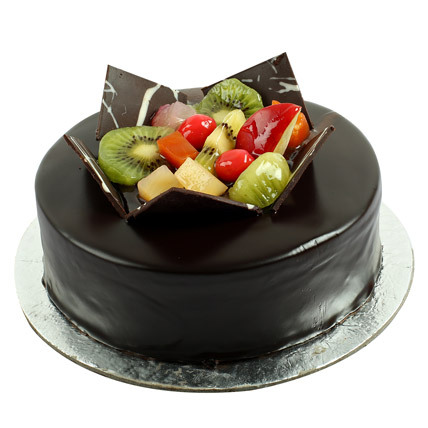 Gift your loved ones with our Chocolate Mix Fruit Cake. layers of sliced pineapple and fresh strawberries or cherries. 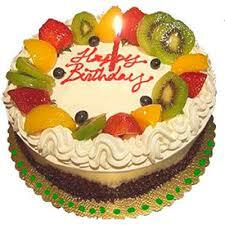 Send Cakes, Send birthday cake, Special mix fruit cake to Vasai, Borivali, Pune and all over Mumbai. Even the hardest-to-please chocolate addict will be more than satisfied by this decadent creation. Creamy chocolate mousse provides the filling for two layers of impossibly moist chocolate cake. As if that wasn\'t enough of a cocoa fix, the entire cake is enrobed with a milk chocolate icing and dark chocolate glaze. 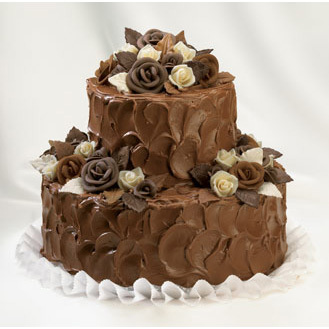 Fudge rosettes and dark chocolate shavings make the cake as beautiful as it is delicious. 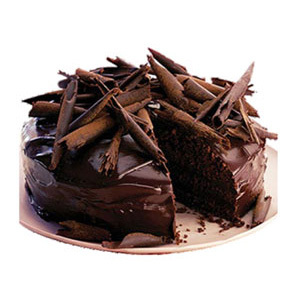 This birthday cake with its heavenly taste is sure to fulfill the demand of the taste buds of the birthday boy or girl. Even the hardest-to-please chocolate addict will be more than satisfied by this decadent creation. Creamy chocolate mousse provides the filling for moist chocolate cake. Available in egg and egg-less type. A delightfully tasty treat to surprise someone special in a special way. Gift your loved ones with our Mix Fruit Cake. Two layers of sliced pineapple and fresh strawberries. Send Cakes, Send birthday cake, Special mix fruit cake to Vasai, Borivali. 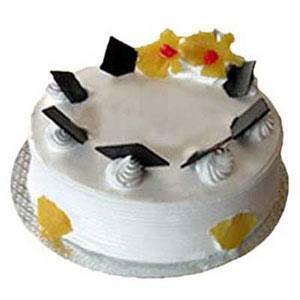 Our cakes are prepared by former chef of a 5 star bakery in Mumbai. A delightfully tasty treat to surprise someone special with a special way. 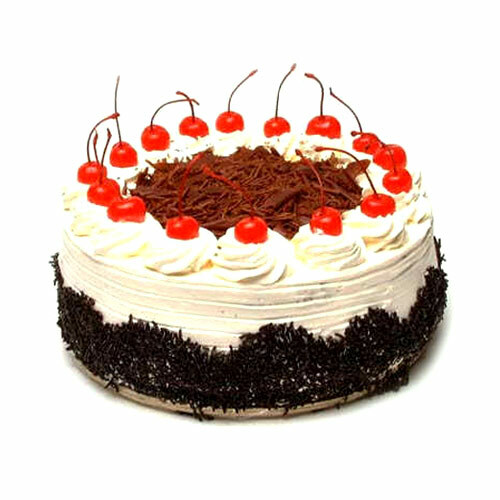 Gift your loved ones with our Black Forest Cake. 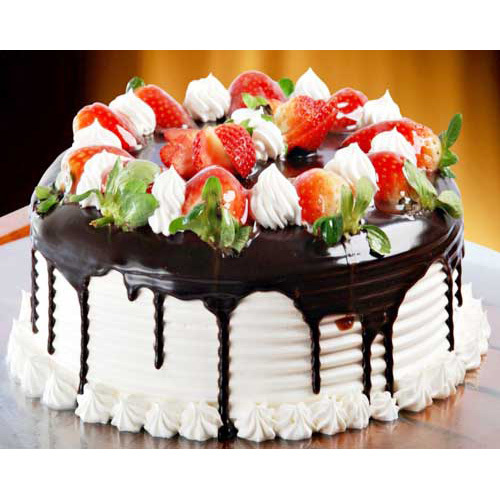 Send Cakes, Send birthday cake, Special Black Forest cake to Vasai, Borivali. White Forest cake is named into the most delicious cakes of all time. The cake is prepared only by experienced bakers and with utmost care. This cake is ideally the cake of the season. Natural flavored pineapple cake will definitely give real pineapple taste. Most preferred cake, especially kids love it. 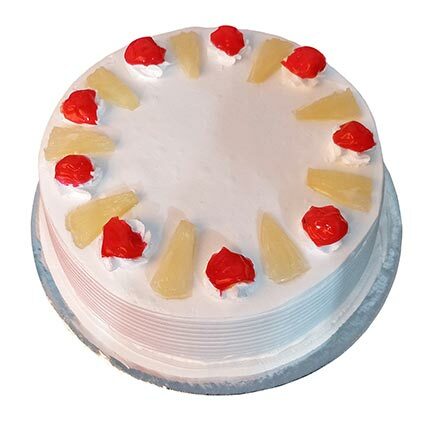 White creamed cake with delightful taste will makes your special valentine real happy and surprised which will make you more charming for her/him. 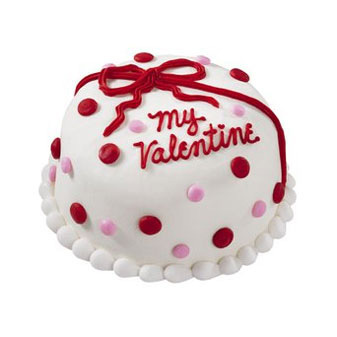 This special cake will always remind of the wonderful VALENTINE day you have gave her/him!!!! 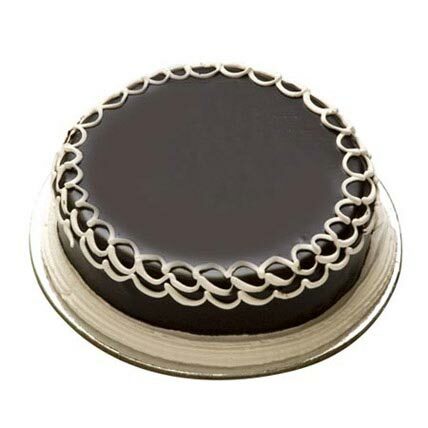 Here is a yummy delicious 500 gms Chocolate Cake beautifully outlined with whipped white vanilla cream on the top. Surprise your loved one in a special way with a lip smacking delish Chocolate Cake that they are going to love for sure. The cake has been given an awesome touch with the cream. Get this present for your love today from Vasai Flowers to get a yummy and delicious smile from their side. A birthday, or anniversary or any other occasion gets complete only when a cake is cut and served. 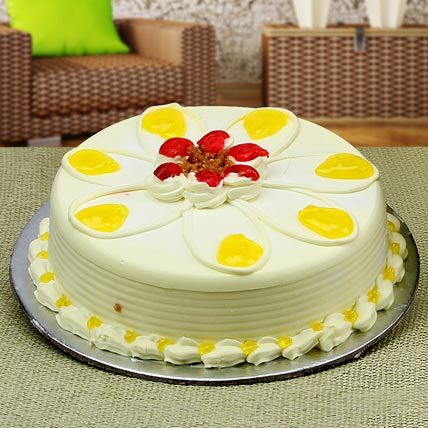 Vasai Flowers provides you the best of Butterscotch Cake which is yummy and creamy. Butterscotch is one flavour which is universally loved buy all. The 500gm cake is decorated with cherry toppings, chocolate chips and vanilla cream. A birthday, or anniversary or any other occasion gets complete only when a cake is cut and served. 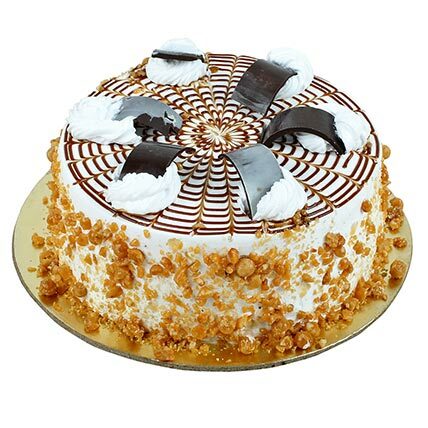 Vasai Flowers provides you the best of butterscotch cake which is yummy and creamy. Butterscotch is one flavour which is universally loved buy all. The Half kg cake is decorated with Vanilla sponge layered with butterscotch cream and topped with nougat. Time is too slow for those who wait, too swift for those who fear, too long for those who grieve, too short for those who rejoice, but for those who love, time is eternity. So share your eternal love for your beloved in a very special way with Vasai Flowers. 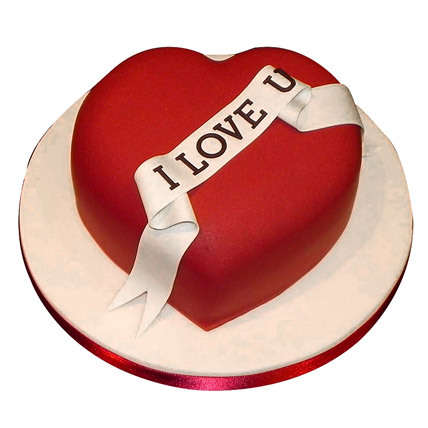 Get Red heart shaped fondant cake with I Love You written on a satchel style for your love and celebrate this Valentine's Day with utmost sweetness. 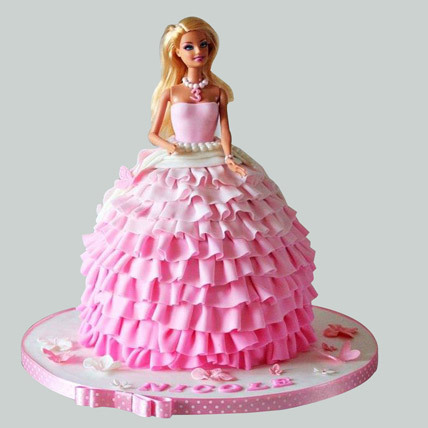 This Barbie Cake will be a sure shot delight for your little princess daughter who is a huge fan of Barbie. 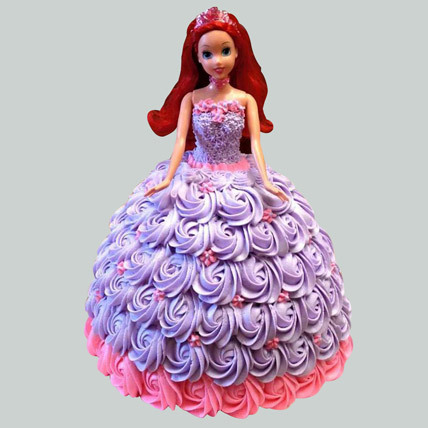 It will take her imagination and fancy to the next level with the ordering of this delicious fondant cake for her birthday. She will definitely love this sweet surprise and her madness for Barbie will get a notch higher. Barbie is the cutest doll of the world and has an amazing fan following. 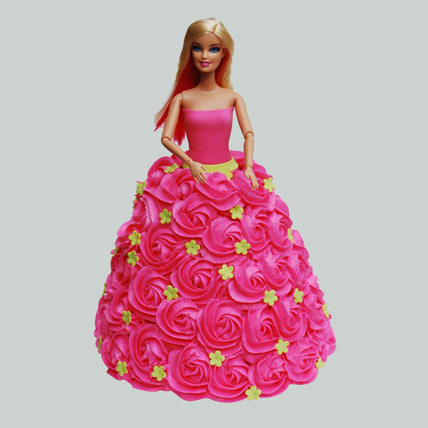 On your daughter’s upcoming birthday occasion, you can select this Barbie cake and surprise her in an endearing way. She and her friends would be too excited to taste this cake. 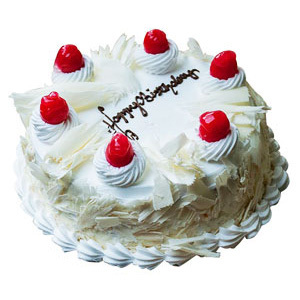 So, don\'t wait anymore and bring in this alluring cake.This is a Cream Cake. Have you ever wondered a combination a smooth touch of Velvety roses along with the favourite cartoon character on your birthday cake? If not, this cake is exactly prepared as per your imagination. 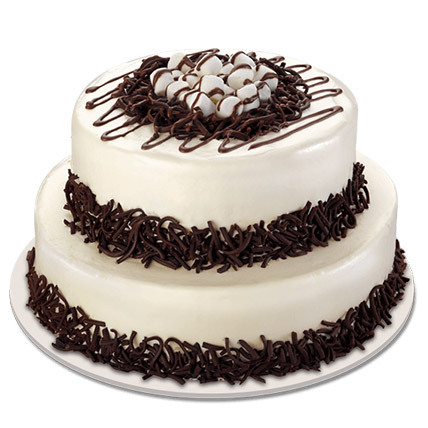 It has the amazing visual appeal and the mouth-watering taste that makes it a true winner.This is a Cream Cake. It is time for the birthday celebration of your beloved daughter and you want to make it a grand affair. 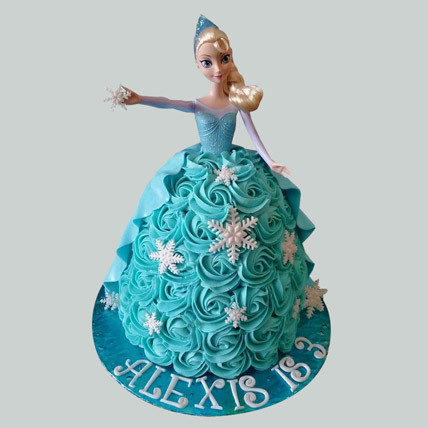 You don\'t need to do anything special as this Barbie cream cake can effortlessly make the birthday celebration of your dearest daughter truly remarkable in more than one way. Order it now for her. 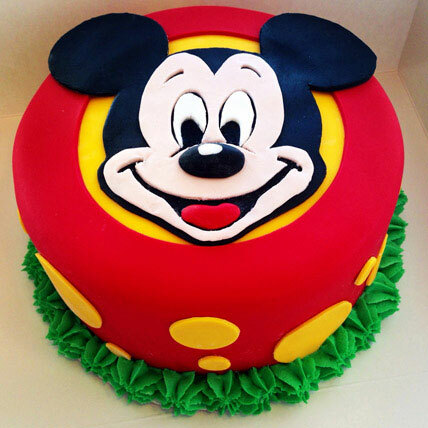 Get this cheerful Mickey Mouse cake for your little son who has just turned five years old and it is a wonderful moment for the entire family. Make the event even more fantastic by ordering this special cake for him on his 5th special birthday party which is no less than a festive occasion.